Every day, millions of people either see or use extruded aluminum shapes without even realizing it. It all starts with a customer who reaches out to one of the top aluminum extrusion manufacturers to have a standard or customized product made. Using superior-quality raw material combined with an extruder machine, the experts transform aluminum alloy into a broad range of shapes with a distinct cross-sectional profile. 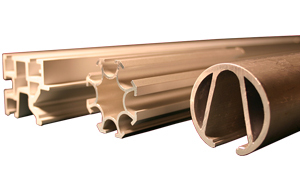 Because of the material’s durability, lightweight, strength, and resistance to corrosion, among other things, companies of all sizes and industries benefit from aluminum extrusion shapes. Aluminum’s incredible versatility makes it a perfect choice for extruding parts and components that most people take for granted. Following are some key examples of extruded aluminum shapes in the world we live in today. Residential and Commercial Building Supplies – As you kick back to watch a movie in your home or sit behind a desk at work, you probably have no idea how many aluminum extrusion shapes the builder used to make that possible. Some of the finished products include bathroom fittings, wall panels, window and door frames, fencing, and an abundance of other architectural components. Transportation – Aluminum extrusion manufacturers also work closely with the transportation industry, making electronic and mechanical components, as well as structural panels for automobiles, aircraft, boats, trains, buses, and even space shuttles. Household and Work Items – You know the couch you plop down on at night to relax? There’s an excellent chance it has extruded fittings. Additional household goods that contain aluminum extrusion shapes include window blinds and showers. Manufacturers make profiles for workplaces too such as tradeshow displays, bathroom stalls, chairs, desks, and office partitions. Electrical Products – This industry also relies on reputable manufacturing companies for a broad range of finished products. Included are cables, tubing, and wiring made from aluminum. These and other extruded aluminum shapes make up parts and components in printers, copy machines, keyboards, computers, vacuum cleaners, DVD players, televisions, and the list goes on. Lighting – Extruded parts play a significant role in lighting, whether floor lamps, LED lighting tracks, table lamps, ceiling lights, or reflectors. Packaging Material – You might find it surprising that extruded shapes made from aluminum benefit the packing industry as well in the form of foils, wraps, and cans. Sporting Goods – Aluminum extrusion manufacturers make it possible for you to enjoy activities. They use this process to make baseball bats, golf carts, hockey sticks, pool rails, bikes, exercise equipment, archery sets, and much more. Regardless of the extruded shape you need, it is imperative that you work with a reputable manufacturer. At RPM Industries, LLC, we take great pride in delivering outstanding extruded products that meet our customers’ needs.